★With fisheye lens you can create interesting tubby images; macro lens is used for taking extreme close-up pictures of verysmall objects; wide-angle lens helps shot more landscape, which brings you intoan amazing world. ★ The kaleidoscope lens can see a lot of thescene through the lens image overlap, the kaleidoscope of wonderful world witha scene overlap, it is very magical . ★ With telephoto lens, the magnification is 2x,you don't need to work very close to the object, telescope lens can take clear photos of far distance. ★Flow filter takes the static object into dynamic effects, no need any image software you can take a wonderful and creative photo. ★Star filter addsa dramatic Star flare to very bright areas. ldeal for photographs of nightscene and ladies wearing jewellery or other objects with strong reflections. ★Radial filter allows you to shoot a radial visual effect, which helps you to easily capture avisual impact photo. ▲When using macro lens to shoot, it's normal to become blur at the begining. You need to put your smartphone very close to the object being photographed, the distance is about 1-3cm,only in this way,the mobile phones can be achieved focus. ▲15x macro lens and 0.63x wide lens is screw together upon receival, unscrew the wide lens, you can get the macro lens. ▲When you use the fisheye lens, there are dark corner on the picture, if you mind, please don't pay for it. ▲It's not fit for dual lenses,such as iphone 7/8 plus. MULTI-FUNCTION OF LENSES: Create fun shots with the fisheye lens which allows the phone/Pads to shoot fun circular pictures,the wide-angle lens to shoot landscape or even group pictures,the macro lens to take pics of small objects like flowers and insect,the telephoto lens for shooting distance pictures,the CPL lens to eliminate reflected light and create beautiful color. 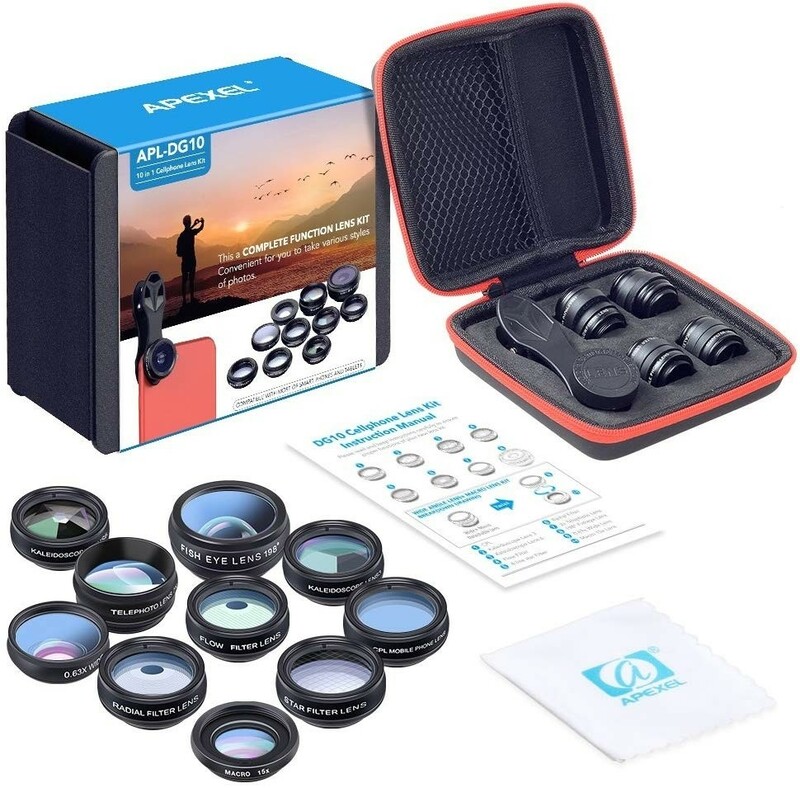 HIGH QUALITY CELL PHONE LENS AND EASY TO USE:Very professionally manufactured product made from aluminum,not cheap plastic,to increase the durability of the product,Put the clip install on phone camera and make sure the lens is aligned with phone camera lens. (it's better to use without phone case)Shooting artwork pictures by using your smartphones with our phone camera lens kit,enjoy the technical image effect. 2 IN 1 WIDE ANGLE & MACRO LENS: Twist the wide-angle lens and macro lens together.You can use wide angle,just connect two shots to the provided clip.To use a macro lens, simply remove the wide-angle lens. A: Yes! Our lenses are compatible with all iPhones, iPods, iPads, Androids ... basically every smartphone in the market. A: No it doesn't get loose, two screws make it so firm, and the soft rubber inside can protect your phone from scratches. A: You totally can! As long as the case has a big enough opening around the camera. If the opening is very small, it still may work, but maybe there are black shadows. Thicker cases may cause slight light leaks. So I suggest you'd better take off the case when you use the lens, that's worthwhile to get better photos.